This is a famous quote from the Tao Te Ching, text for the philisophical and religious concepts of Taoism. The literal translation is "A journey of a thousand miles starts beneath one's feet" - 千里之行，始於足下 (I grabbed that Chinese text from Wikipedia, Zippy, so if it's wrong, yell at them). I don't remember the first time I heard it - it might have been from the book "The Tao of Pooh". Yet, the statement is so accurate in it's simplicity. You can break down any activity, no matter the size, to it's smallest component. It's true about collecting. No matter the number of cards we have in numerous binders and numerous boxes in numerous rooms, it all started with that very first card that sparked our passion to collect. And like any journey that make last a thousand miles, how we look at the start can be different than how we are at any later point of the trip. 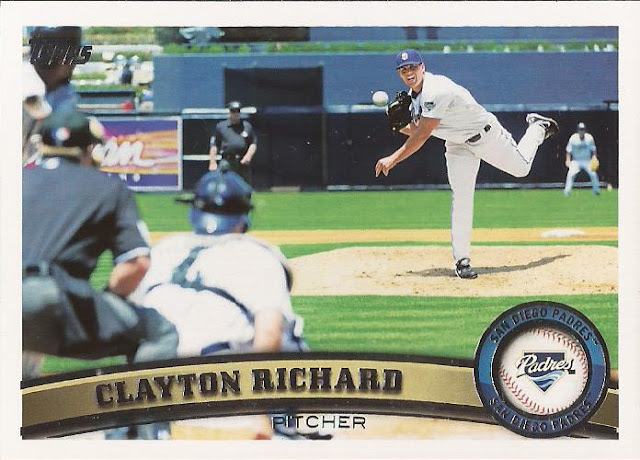 This Clayton Richard is the start of many cards in the Hidden Gem binder of similar images - the pitcher in release of the ball, the focus on the hurler while the rest of the photo has appropriate blurred views of the rest of the participants. There's probably one or two cards with this style released each year, I bet, and I think there is only one I ever came across that didn't make the cut for a slot. Your eyes are drawn to the player in focus immediately, but almost as fast, you begin to scan the rest of the card, finding first the ball, then the batter and the catcher. Next the second base umpire, and finally, the player in center. Your brain is able to take those out of focus elements and put them back into some bit of focus. You can almost make out the catcher's nameplate, the home plate umpire's number, the ad on the left field wall. But not completely. And you come back to the player in focus. Before running on treadmills, building complex Rube Goldberg machines, riding single wheeled vehicles in sync or flying on the Vomit Comet, OK GO was just a Chicago band making music and releasing "normal" videos. No huge gimmicks in this video. Simple music with a couple goofy. subtle jokes sprinkled here and there. Released a full 4 years before they made exercise equipment cool, if you look hard enough, you can see their potential to grow video into a fun form of art. Clayton Richard has never looked so good! Also, I saw OK Go in Grant Park a few years back, boy oh boy, do they ever put on a live show. It's a shame that their music has come to be overshadowed by the video gimmicks though; quality power pop that does the Chicago music scene proud. Pretty sure the ad is for Sycuan Casino. Otherwise it's a nice looking card. I've been meaning to dig into OK GO's catalog one of these days.